Your brand has invested considerable time and resources into a specific social network—whether that’s YouTube or Tumblr. But suddenly, you’ve hit a wall and just aren’t seeing any clear ROI. When it comes to business, social media should impact your bottom line in a measurable way. Otherwise, you’re wasting your time. Still, it can be difficult to determine when to throw in the towel. You need to recognize the signs. Is the writing on the wall? Below are a few ways to tell. The first indicator that it’s time to leave a social network is that you’re not seeing adequate results over an established period of time. Regardless of your organization’s skill at using Facebook, Twitter or any other network, understand that it takes time to see results on social, as success doesn’t typically happen overnight. To understand how long it should take to generate results, create a timeline that aligns with your goals. Timelines may vary, as increasing engagement on a social network could take a month, while driving social sales might take upwards of six months, depending on your brand. Give your company enough bandwidth to test different tactics without wasting too much time on a channel that just doesn’t resonate. Conduct network test runs in three-, six- or 12-month increments. Evaluate your progress at various points. If your organization hasn’t seen results by the end of a predetermined time, consider a new direction, or stop using that network entirely. When launching on any social channel, find out what content engages an audience by alternating what you share. Change up the copy in your posts, vary the time of day you’re publishing and share various forms of content like GIFs, short videos, articles or static photos. After testing the effectiveness of several tactics, your brand should have a good sense of what works or if it’s time to shut it down. 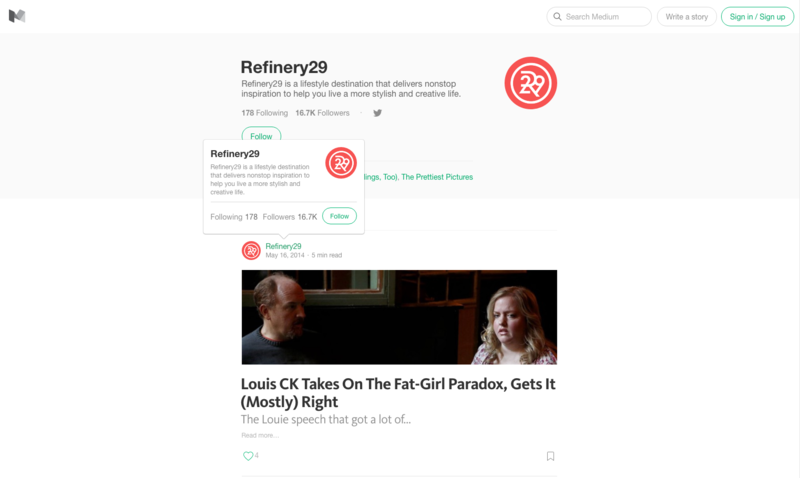 Refinery29, an online lifestyle publication was active on Medium from March 2014–April 2014. Focused on publishing original content, Medium has proven to be a successful platform for brands with a limited budget looking to establish an online content hub. Prior to publishing on Medium, Refinery29 had a reputable and recognizable owned property. Since a large portion of the publication’s readership was likely visiting their website directly or accessing content via the brand’s sizable Facebook community, dual publishing efforts on Medium may have proven to be less effective. If your target audience isn’t actively responding to your content on a certain network, it could be because they aren’t aware your brand is there. Or, perhaps, your audience is accustom to discovering your content elsewhere. A social network’s demographic is another factor that can heavily influence a brand’s success or shortcoming. If your audience skews towards an older demographic, you probably won’t find success on Vine, whose largest user base consists of Millennials between 18–24. Just because a network is effective for certain brands or popular with a key demographic, doesn’t mean your brand will succeed in that space and that’s OK. It’s more important to distribute high-quality content where your target audience is active and responsive than to be present and underperforming on a platform. Social media is constantly evolving, making the landscape somewhat volatile. A hot network today may be old news tomorrow. Take Viddy and Pheed, for example. Both rose to fame quickly but failed to become profitable, maintain an audience or articulate value in a crowded space. Once a social network loses its audience, drops in engagement or is no longer aligned with your brand’s objectives, it’s time to pull the plug and allocate your resources elsewhere. 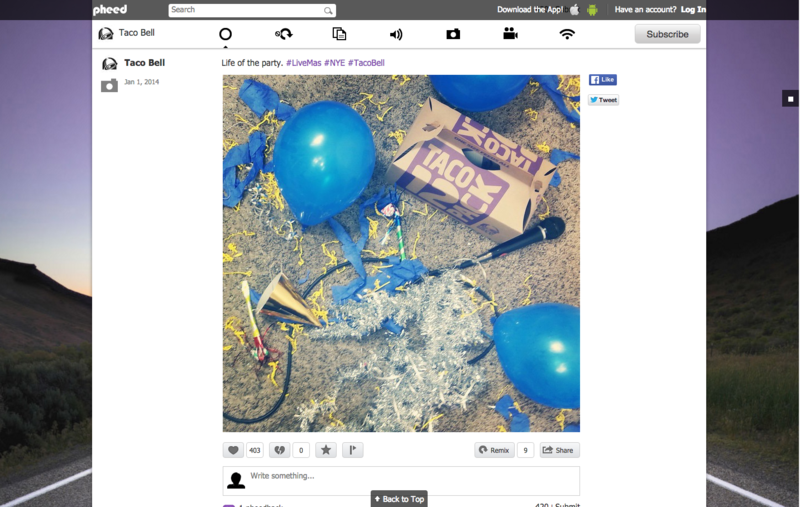 Of course, a social network’s overall failure isn’t something your brand can control. You can, however, monitor the channel’s growth and the impact of your brand’s efforts. Taco Bell followed this approach. After a year on Pheed, the fast food chain called it quits, likely due to the network’s lack of success. Taco Bell’s focused timeline (March 2013 to January 2014) and repurposed content doesn’t appear to have been too costly either. Your brand doesn’t require a presence on every network—that approach will spread your efforts too thin. Still, there’s no harm in testing out a new network with minimal investment to gain learnings. Just remember to remain strategic about where you’re active and why. At the end of the day, there’s nothing more useless than being on a channel just for the sake of it. To know when a social network isn’t driving results for your brand, you need to understand what you’re trying to achieve. Set specific goals for every network. Whether your goals are to raise awareness, generate leads or drive sales, your objectives must be clearly defined so that everyone involved understands if you’re succeeding or failing. While objectives should vary between networks, it’s important that social engagement transcends platforms and remains a key component of your overall strategy. When you think about social media engagement, it’s smart to break it down into something tangible, such as a long-term relationship. Engagement isn’t just a single interaction with one of your customers, but an open line of communication over a period of time. If engagement isn’t correlating with the time and effort being put forth, you’ll want to revaluate your approach. Start by examining your budget. While initial investment in a new network should remain low, you may have to account for unexpected content creation and distribution costs. Ideally, you want to refresh and repurpose as much existing content as possible. However, if you see that the style of your existing photo assets aren’t optimized for a specific network or that your video content is too long, you’ll want to recreate or edit these materials before you share them. Popular networks like Facebook, Twitter, Instagram and Pinterest offer the option to pay to promote posts and amplify your content’s reach. If you’ve invested in new content creation and are still not seeing the engagement results you desire, paid content distribution is something to look into and consider. After you’ve exhausted all of your options, if engagement on a network is still underperforming, it’s time to analyze your results and call it quits. On social media, it’s important to allocate your time, resources and budget where they will have the most impact. Remaining agile and relevant in a rapidly changing environment requires that brands test new social networks and learn from them. However, it doesn’t require that brands remain on a platform that’s not delivering on business goals. Calling it quits can be tough, but is necessary in maintaining a well-performing, strategic social strategy.